The State of Maine requires NCCAOM Certification for re-licensure. Browse NCCAOM PDA or CEU courses. Requirement: An Applicant for renewal must obtain 30 continuing education units over the two year biennium. Continuing education credit will be given for programs which are directly related to the knowledge and clinical practice of Acupuncture and Oriental Medicine. According to Chapter 5: Standards for Continuing Professional Education for Acupuncturists and Naturopathic Doctors, section 2(1)(A), a continuing education activity must be directly relate to the knowledge or clinical practice of acupuncture or Oriental medicine. 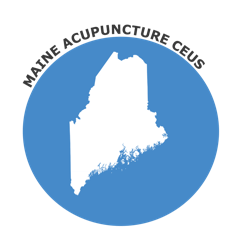 The process of getting Maine continuing education credits is simple, convenient, and easy: Download the course, finish the online quiz, and receive a certificate of completion immediately online. You can finish all your continuing education requirements on you desktop, mobile phone, or I-Pad. Reading material are printable. Courses are either in Written format or in a Live webinar. Visit our Acupuncture CEUs page to find out about any other state requirements. Your license number, name, and date will appear on your certificate automatically.